Today’s guest is Liberty Blake. She’s a super writer and an awesome friend. She’s in this great anthology from Still Moments publishing. I hope you’ll check out her story. It’s a really fun read! Enjoy! Hi, Jillian. Thank you for sharing your space with me. 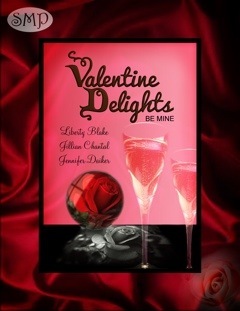 I love your stories and am honored to be in Valentine Delights Be Mine with you. A few years ago I worked as a cocktail waitress in a country bar (in the Boston area) and a bartender in a small hotel. They were both fun places, but you wouldn’t choose either place for a romantic dinner. There were two nights a year I refused to work. One was New Years Eve. The other was Valentine’s night. That is the night when all the women who don’t have a Valentine get together at the local watering hole and try to drown their sorrows. It is also the night when they are easy prey for the “Smooth Move Lounge Creeper”. SMLC for short. The SMLC is a cross between an octopus, an ape, and a snake. They slither in when a woman is at her most vulnerable. The after effect of an encounter with a SMLC is worse than a hangover. Then there are the couples who come in. The woman might have a date, but he didn’t spring for a nice meal in a good restaurant, instead he brought her for the all-you-can-eat free nibbles. It is always a special moment when he asks hopefully if it is “ladies night”. Florist Melody Roberts, the heroine of Change of Heart always told her friends she hated Valentine’s Day, but the truth was her no good boyfriend never took her out. In seven years he never gave her so much as a card. She is finally dating a dreamboat and is eagerly looking forward to Valentine’s Day. That is until he didn’t ask her out. Meet Melody and her friends in Change of Heart. After the night they spent in the hot tub, Melody believed her new man wanted a relationship, but now it was Valentine’s Day and not even a phone call. Did he have a Change of Heart? Change of Heart, The Coroner’s Heart, and Latte Love are together in Valentine Delights the Be Mine Anthology from Still Moments Publishing. That is such a tease. lol I want more. So I guess this means I’ve gotta read to find out what happens in Change of Heart? Great job, Liberty and congratulations on your latest release. She is a tease!! Thanks for coming by! Lynn, I hope you enjoy Change of Heart. Hehehe. Yeah, I know you, for sure! “Smooth Move Lounge Creep” LOL The name says it all! I met a few of them in my disco days. (Okay, so now you know my age.) Great post, Liberty!